Today is Pongal ~ happy celebrations in all parts of Tamil Nadu ~ in fact today celebrated as Harvest festival across the Country. In Jan 1988, in Pongal Test against a mighty West Indies, Narendra Hirwani made a dream-debut claiming 16 wickets (8 in each innings) and handing over a big defeat for the Champion side. Today at Adelaide, Indian bowlers had another off-day. Bhuvi started well removing Finch and ended up 10-0-45-4; debutant Mohammed Siraj had a match to forget with figures of 10-0-76-0 while Kuldeep Yadav who initially bamboozled Aussies, ended up 10-0-66-0. At a time when things appeared going Aussie way, Jaddu with mercurial alertness effected a direct-hit runout of Khawaja. In this present tour, India started with the first test on Dec 6, 2018. Adelaide is the capital city of South Australia and the fifth-largest city in Australia. Adelaide is a coastal city situated on the eastern shores of Gulf St Vincent. Port Adelaide is a suburb of Adelaide lying about 14 kilometres northwest of the City of Adelaide. It lies within the City of Port Adelaide Enfield and is the main port for the city of Adelaide. The city was founded in 1836 and was planned as the capital for British province in Australia; named after Adelaide of Saxe-Meiningen. Princess Adelaide of Saxe-Meiningen (Adelaide Amelia Louise Theresa Caroline; 1792 – 1849) was the queen consort of the United Kingdom and of Hanover as spouse of William IV of the United Kingdom. Around 4.40 pm – it was the last over and the first ball of Behrendorff was fiercely hit by Dhoni – a length ball on Offstump, Dhoni leaned back, cleared his front leg, bottom hand to the fore, ball went sailing over long-on and all of us felt so elated. That was Dhoni’s 50 and more importantly brought India score equal .. .. and how many times has Dhoni done that – hitting a six of the last ball of the penultimate over or off the first ball of the last over ! MSD’s fans went berserk. ~ that was his 221st hit over the fence – 10279 runs in 334 matches with 69 fifties and 10 tons !! Today it was a tale of two captains at Adelaide Oval. While Australian skipper Aaron Finch failed again, unable to overcome what cricket great Adam Gilchrist described as a "glaring issue," Indian counterpart Virat Kohli composed his 39th one-day international century, leading his side to a series-levelling victory ahead of an MCG decider on Friday. MSD too shone and was instrumental too, and despite feeling the pinch late in his side's run chase on a sapping Adelaide day. Chasing 299 runs to win on Tuesday at Adelaide Oval, Kohli struck a sublime 104 from 112 deliveries as India reached its target with four balls remaining. 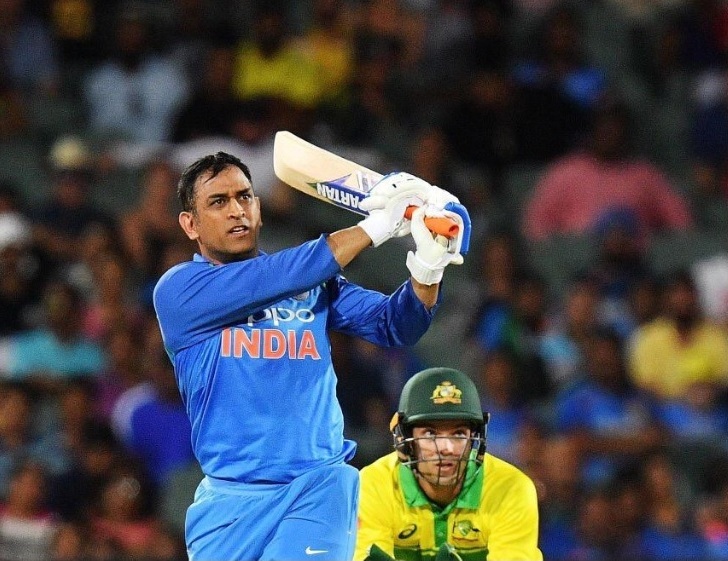 Kohli's 39th ODI ton was followed by a typically ice-cool finish from MS Dhoni (55 not out from 54 balls) as India set up a series decider in Melbourne on Friday. When Dhoni arrived at the crease, the equation read 139 off 118 deliveries. He took it to the last over. He hit the first ball for a six, and made sure India won the game. MS Dhoni was in his element in Adelaide and Virat Kohli was highly appreciative of him. "There's no doubt that he should be a part of this team. When you haven't played so much cricket [recently], you take a bit of time to get back into the groove, and tonight was an MS classic," Kohli said at the post-match presentation. "He takes the game till the end, but only knows what's going on in his mind, he calculates the game so well. He backs himself to hit those big shots when required. So hats off to him." India had gone 0-1 down in the three-match series and that loss had put a harsh spotlight on Dhoni's role in ODIs. He made 51 off 96 deliveries - although there were mitigating circumstances, namely he had walked in with his team 3 for 4 chasing 289. The score card reads : India 4 for 299 (Kohli 104, Dhoni 55, Maxwell 1-16) beat Australia 9 for 298 (Marsh 131, Maxwell 48, Bhuvneshwar 4-45) by six wickets. Australia didn't make the early inroads they did at the SCG, this time Shikhar Dhawan peppered the boundary five times in a 28-ball 32 before trying for a sixth and lofting a catch to mid-off. After the early high tempo, the chase settled into a steadier pace with Rohit Sharma and Kohli adding 54 in 10 overs followed by 59 between Kohli and Ambati Rayudu. Rohit, who made 133 in Sydney, was starting to move through his gears with sixes off Peter Siddle - a wonderful pick-up off the hip - and Lyon, when he was caught deep on the leg side by Peter Handscomb, who judged it well coming out of the setting sun. The bowler, Marcus Stoinis, celebrated in a manner not dissimilar to Bruce Banner transforming into the Hulk. Rohit 43, Shikhar Dhawan 32, Kohli 104, Dhoni 55*; KD Karthik cameo 25* ~ the failure was Ambati Rayudu who perhaps should pave way for Shubman Gill, who is there as replacement of Hardik Pandya. The handling of the disciplinary issue involving Hardik Pandya and KL Rahul, suspended for comments made on a TV talk show, has created another flashpoint in the differences between the two members of the Committee of Administrators. While CoA chairman Vinod Rai wants Rahul Johri, the BCCI chief executive officer, to conduct the initial inquiry, Diana Edulji has said it should be done by a committee comprising the CoA and the BCCI's office-bearers. Edulji has been firmly against Johri conducting the inquiry considering the "grave sexual allegations" against him last year. A three-member ad-hoc inquiry committee did not find him guilty of those charges and he was cleared to resume work.